High Commander Lesto Arseni is the most feared man in the Harken Empire. None but the High King dares risk his wrath—and a pirate who once punched him in the middle of the imperial pavilion. A pirate who later snuck away with Lesto to an empty room, touched him in ways far more memorable. And then immediately bolted like a man who'd gotten what he wanted. Shemal just wants to live a normal life, leave his pirating days behind him and prove that he's respectable now. The last thing he needs is the two idiots who show up wanting his help with the noble they've kidnapped—the very man Shemal had been hoping to prove himself to, the man he hasn't forgotten since Shemal punched him a year and a half ago. You might have noticed yesterday that I posted a review for a book called 'The High King's Golden Tongue'. I'd wanted to read that book for ages and I was constantly squirreling off and doing other things but this is the reason I finally pulled my act together and read that awesome book because on July 13 this is going to be a thing...that's right book #2 is being released and it's called 'The Pirate of Fathoms Deep' and it's good folks seriously good. I mean I have to admit I was a little more partial to 'The High King's Golden Tongue' but I think that's mostly because I really, really liked Allen and Sarrica but that does not mean this is not also a really good story...because it is. 'The Pirate of Fathoms Deep' is about Lesto and Shemal. Lesto as we know from the first book is the High Commander of the king's troops as well as the Lord/Duke/Ruler sorry I'm sketchy on the correct term here but he's in charge of Fathoms Deep that's where he's from. We also met Shemal in book one, only we didn't realize it at the time, not that we were meeting him or that Shemal was his name and we also didn't realize that he gave Lesto a little bit more than a black-eye (really, it's in the blurb). So here we are a year and a half later and fate have brought these two men together, in what proves to be, yet again, some rather unusual circumstances. Ms Derr definitely stepped up to the plate with this one and again from the very beginning and I do mean very beginning, seriously did you look at that cover? Another work of sheer beauty. I honestly want posters of these book covers for my office walls they are so gorgeous. 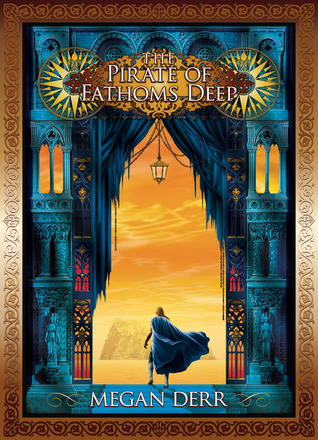 'The Pirate of Fathoms Deep' definitely gives more focus to the relationship between Lesto and Shemal but without taking away the action, adventure and mystery that I enjoyed in the first book. For me this was a definite win. While the relationship between these two men got it's beginning in the first book it's not until this story that the when and how of it becomes clear. In book one their meeting was just a passing event that occurred and while I remembered it, it was not given any undue focus and for me it was one of those neat little surprises that had me bouncing in my chair as I remembered the events from the previous story and my brain quietly cackled with glee at the subtle way that these two books were being woven together. One of the things that I'm really enjoying about both of these books are the personalities of the MCs. I love that they speak up for what they believe in, the are fiercely loyal to their friends and family and that they love who they love unapologetically. Lesto wants to be with Shemal. He doesn't care about where he came from or whether he's considered socially acceptable because of his station in life and the same for Shemal. It's Lesto that he wants not his money or power. Add to all this a pair of royally incompetent kidnappers, some cut throat mercenaries, a sister baring unexpected surprises, one man willing to risk it all for a second chance with his pirate and one pirate who wants a chance to show that he's worthy of that man and what you've got is a story that's worth enjoying from the front cover to the very last page and I do mean the very last page the one that tells us that there's more to come from this series and I am so looking forward to what comes next. An ARC of The Pirate of Fathoms Deep was graciously received from the publisher through Net Galley in exchange for an honest review.